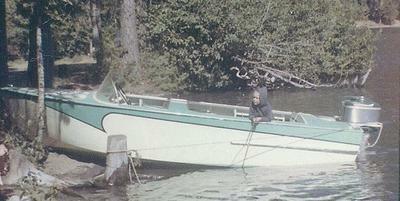 Now Know as "Lady Like You"
My father-in-law built this boat in 1958 in his garage. This 15-ft. cabin cruiser was designed by William D. Jackson, N.A. She has been passed around to family members and is now in my care. I've removed all the trimmings and completed sanding. Next up is to paint her. I am totally intimidated by that process! I would like to restore to the original colors and decorative painting. It's a beautiful 1950's turquoise with white base. She was a mess when I picked her up in Bend, Oregon two years ago. Stored in the open with a rotting tarp she amazingly had very little wood rot. I had that checked by a pro! Any advice on diving into the paint project is appreciated. The original windshield was fiberglass and cracked in the process of cleaning. A couple cleats are missing as are the gunwale bars. I'll be on the hunt for a few of these parts. Any advice on my project is welcomed. I would especially like to find other Sea Babe owners. All hitched up and ready for the boat shop guy to install the windshield. When he saw the boat again (having seen it at its very worse) he was very complimentary about the work that had been done. All major painting is done! Today I painted the doors to the seat storage boxes and the dashboard ditty box. The seats were painted and the box is stained. I'm using a mahogany stain for the dashboard. I've put one coat of urethane on it yesterday. I plan to put 3-4 coats depending on how it looks when I get to that point. I also cleaned and softened the leather seats. My BFF finished painting the back bench. Next up is to clean the chrome and get it reinstalled. I'm starting with the hinges for the 3 doors I just finished. The weather changed here so I had to put the boat in the garage for the last of the painting. I hope to get that done this week. In the meantime I'm looking for a steering wheel. Plans call for a 15" wheel. I'd like to replace the black plastic one on there now with a wheel from the 50's that is in keeping with the color scheme of the day. I really like the Riva wheel pictured here but they are hard to find. Two tone which matches the boat restored color scheme would be perfect. If I can't find that style/color combo then all white would be the next option. I've attached some pictures here to give you an idea what I'm looking for. Please let me know if you come across the perfect steering wheel for my little project. Looking superb, well done girls. I already posted pics of the sanded and primed stages. This week I started on the colors. There are only two - white and turquoise. She's looking good if I do say so myself. If you read this thread you'll see I was pretty intimated to start the painting process. No more! It's way easier than I expected. Photos to follow. I'm about to try painting. You can see the original design in the pics connected with this post. I hope to restore the original design and color scheme. The second picture is from a 1990's repaint (not restoration). I'm attaching a picture of the last products used. 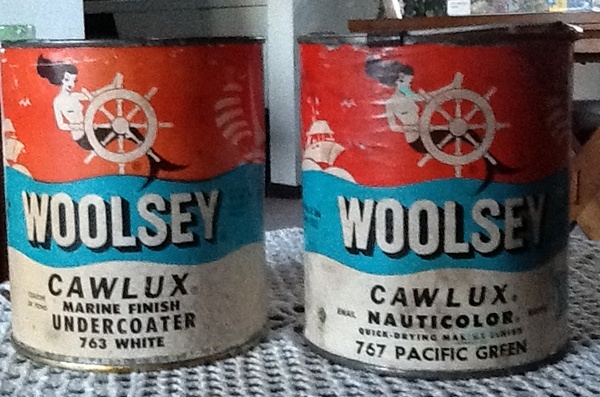 Do I use the undercoat on the ENTIRE boat or just the part that is in the water? A neighbor came over yesterday and cut off the old broken coupler. Unfortunately, he left a gash in the tongue. It shouldn't be a problem since it's nowhere near where the new coupler will be bolted on. Still at square one getting the boat to the paint shop. I'm not giving up hope yet though. Thanks everyone for your comments and words of encouragement. This project has been met with way too many obstacles to list. Not with the boat but with life and trying to get her done. I've finally reached the point where I am going to have a local boat shop do the painting. I'll do all the new fittings and trim but I don't have it in me to do the painting. But...before that can happen I have to fix the trailer to drive it about 20 miles from home to their shop. The trailer was also made by my FIL when he built the boy. It's falling apart! The coupler is shot. It's the old square, spring loaded screw down type. It needs to be changed to the lever type for easier use. Can't deliver the boat until that is fixed. That means getting someone out to cut the welds of the old one to bolt on the new one. No, he didn't use bolts - that would have made this fix far too easy, LOL! Anyway, my goal is to be in the water by the end of May. At least now I have found a path to success! Congratulations for taking on this task and preserving your father's efforts! lots of sanding followed by a good 2 stage epoxy resin will seal the wood. Follow up with several coats of marine paint - I used Epiphanes on mine. I used Sea Babe for my hull and added a cabin...turned out great. Look for Big 'D' buried in this site. Barb, how goes it with your boat project? Do you have it painted yet ? Would like to see some photos of it on the trailer as well as in the water. A wood boat, to me, is just a big sign surface. Properly prepped, sanded, primed and painted, it will last you many many years. (IMO), Use a good oil paint vs epoxy. So if you want to repaint in the future, it is easier to sand down. Epoxy paint is fairly difficult. As for the green color, try to find a nice "seafoam green" and you will be happy happy happy. Another woman doing her own restoration. I know it's intimidating but don't "get a guy for that" as my friends always say. I have started and restarted the painting on my boat several times. I just sent my boat post for approval...keep your eye out for the 42' Grand Banks. Please connect me anytime for support or to just tell me how you're doing!